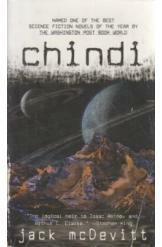 Chindi by Jack McDevitt, Sci Fi. Humanity has explored the universe and given up hope of finding other intelligent life. Suddenly, a broadcast from an alien satellite changes everything we thought we knew, and for starship captain Priscilla Hutchins raises even more questions. Book is in good condition, all pages intact.